Few people would disagree that life is just a bit better along the beach. But beach-front living in one of Florida-s most attractive and growing Atlantic Coast regions is only one of the benefits promised by The Meridian, a Homes by Towne development on the Space Coast. "All condominiums include individually enclosed first floor garages with automatic door opener and remote camera screening of the lobby entrance. Two state-of-the art elevators serve each building." 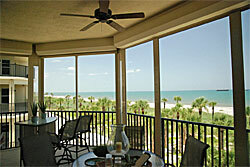 Cocoa Beach itself is world-famous for its proximity to the Kennedy Space Center at Cape Canaveral. But the Space Coast appeals to more than astronauts. Nearby Port Canaveral is home to cruise ships, marinas and fine restaurants. A short drive away, Orlando-s attractions, headlined by Walt Disney World, Universal Studios Florida and Sea World, draw huge crowds. The Meridian is a two-building, mid-rise residential community created in the Homes by Towne tradition of quality, exceptional design and value. The Meridian at Cocoa Beach offers spacious and elegantly-appointed units ranging from 2,180 square feet to 2,570 square feet, all with terraces offering cooling ocean breezes and spectacular views. The terraces range in size from 202 square feet to 419 square feet, adding additional living space. The open floor plans are three-bedroom, two-bath configurations, and all have private foyers. Master bedrooms have direct access to the terrace, as well as extras such as air-conditioned walk-in closets, a whirlpool tub, a separate tiled shower and dual vanities with Corian counter tops. The gourmet kitchens feature a choice of granite or Corian counter tops, a choice of cabinet styles and colors, and 42-inch upper cabinets with crown molding and task lighting. Top-quality appliances include a 25-cubic-foot side-by-side refrigerator, a slide-in smooth cook-top with self-cleaning oven, a microwave/hood combination with touch pad control and a dishwasher with stainless steel interior. A separate laundry room makes wash day easier with a super-capacity washer and dryer, laundry sink and convenient upper cabinets. All condominiums include individually enclosed first floor garages with automatic door opener and remote camera screening of the lobby entrance. Two state-of-the art elevators serve each building. Recreationally, in addition to private access to the adjacent pristine Atlantic Coast beach, The Meridian includes a tropical outdoor heated swimming pool and spa and a two-story recreation and fitness center with community room, card room and party/meeting room. Anyone seeking to launch a relaxing East Coast Florida lifestyle should get on board the Space Coast-s newest and most desirable development before The Meridian "lifts off."